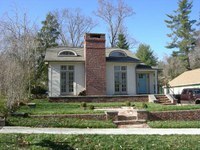 Unusual vernacular Bungalow style one-story house with eyebrow dormers and French doors on either side of a front chimney opening onto a front patio. Walls are the original lapped wood siding. Clipped gable roof. Wing on the north side. Windows are two-over-two, and front doors are the French doors with sidelights. Walkway and stairs lead to the recessed entry at the northeast corner of the house. James T. Fain was listed as living on Clairmont Drive by 1926, so he was probably the first owner of the house. Fain, an editor with the Hendersonville Times-News, and wife Annie lived here until at least 1949. Fair to poor condition. One-story gable roof building with wood siding.